One of the most important factors in aquascaping is the structure of the aquarium substrate. The optimal basis is nutrient-rich soil like for example Aqua Soil by Aqua Design Amano (ADA) , which reduces water hardness and lowers the pH value. Moreover, it contains essential macro- and micronutrients. As in nature, the water plants can take in a large portion of the nutrients they need from the substrate, and they will react with lush growth. 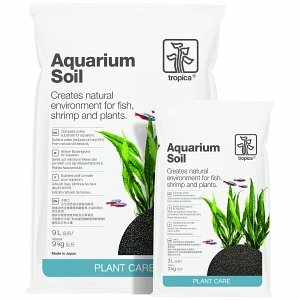 These soils do not only play an important role in aquascaping, but also in shrimp keeping. Microfauna grows especially well on soil substrates, which provides, in turn, baby shrimps with abundant food. Moreover, soil substrates change the water parameters to make them especially suitable for shrimps originating from soft-water habitats like e.g. bee shrimps. In addition to a soil substrate you can use a special substrate fertiliser with an even larger nutrient depot that ensures a long-term nutrient supply via the substrate. Decorative sand is used in unplanted areas and makes open spaces in your aquascape even more attractive. There are numerous substrate additives you can use to increase the quality of your substrate, adding further nutrients in particular as well as useful bacteria cultures, which improves the biological stabilisation of your tank. Substrate is a very important component in aquaristics. Just like aquatic plants and decorative objects such as stones and driftwood, substrates provide an environment looking as natural as possible. The substrate is not purely decorative, though, but has other important functions, too: it is important for the aquarium's biological balance and ecosystem. Due to its huge surface, the substrate offers more than enough colonizing space for useful bacteria and other microorganisms. These bacteria take over important tasks, e.g. during the so-called nitrification process and therefore pollutant decomposition inside the aquarium tank. Especially in aquascaping and plant aquaristics, the substrate furthermore has the job to provide the aquatic plants with nutrients via their roots. Various soils are available through our webshop for this purpose. Whereas most sands and gravels are behaving neutral in water and are nutrient-free, there are dedicated nutritional substrates for aquatic plants. The old-school option in aquaristics would be the application of a substrate fertilizer or putting a layer of fertilized substrate underneath the decorative layer made from e.g. gravel. This bottom layer will be rich in nutrients for your aquatic plants but not in direct contact with the surrounding water. This layer can be enriched further, using special additives in the shape of fertilizer balls, sticks or capsules. Furthermore, applying special minerals and food for sub-surface bacteria as powders is a possibility. 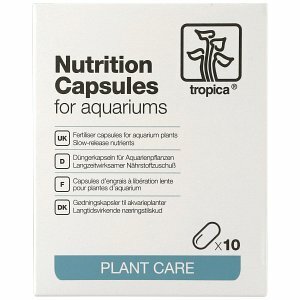 With fertilizers in the form of balls, capsules and sticks, individual aquarium plants can be strengthened in growth in a targeted manner by applying nutrients directly in their root area. Seachem's Flourite substrates are exceptional in a way, that they are water-neutral, but unlike normal sands and gravels, contain important nutrients for aquatic plants. A vast selection of Flourite substrates is available through our webshop. The article "Seachem Flourite" presents these substrates in more detail. So-called soil substrates play a very special role. These substrates actively influence the water values in the aquarium and are often used in aquascaping and soft-water shrimp breeding. Through its ability to bind cations, soil is able to extract hardeners from the aquarium water. 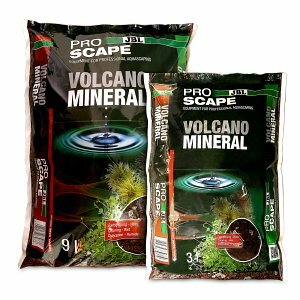 The total hardness, carbonate hardness and pH are adjusted to a slightly acidic and soft environment, which is preferred by many dwarf shrimp, aquatic plants and fish species. 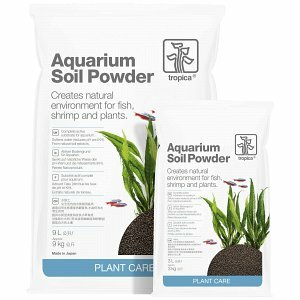 High-nutrient soils are especially recommended for keeping aquarium plants. 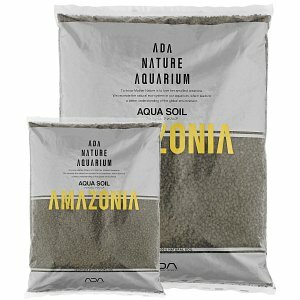 Aqua Soil Amazonia by ADA certainly is the forerunner in this field. This soil offers a vast spectrum of important nutrients - and above all - sufficient nitrogen to the plants inside the aquarium. 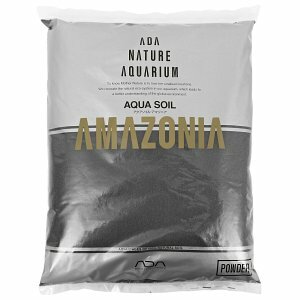 Aqua Soil Amazonia is covered in more detail in this article. 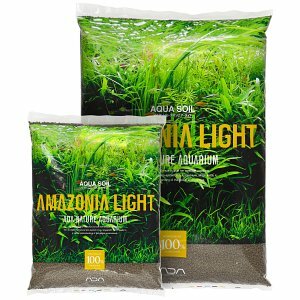 Soils from various renowned manufacturers like ADA, but also Cal Aqua Labs, JBL or Tropica are available through our webshop. Low-nutrient soils for shrimpkeeping like Red Bee Sand or Environment Aquarium Soil are available through Aquasabi as well. The use of a substrate system, with components complementing each other is the best way to ensure excellent plant growth. Companies like ADA, JBL and Cal Aqua Labs offer these complete solutions, which contain substrate fertilizers and additives under a cover layer of soil. The exact construction of a systematically structured substrate can be found in the article "Building the substrate" in our Aquascaping Wiki. 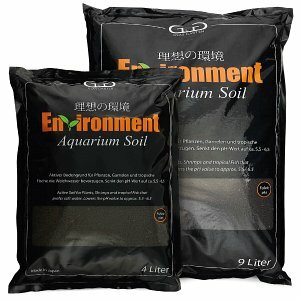 Of course, classic aquarium gravels in various sizes and grains can be purchased online from us as well. Many aquarium animals, like certain types of cichlids prefer sand as a natural substrate. Likewise, sands are mostly used in aquascaping for decorative zones or sand paths. If additionally soils are used for densely planted areas, a mixing of both substrates can happen, especially if burrowing inhabitants like shrimp or catfish live in the aquarium. Lots of tips on how to keep sand and soil seperate from each other can be found in our article on sand and soil in the Aquascaping Wiki. All substrates from our webshop are available in various colorations and grains. Natural, darker colours like black and brown are the standard in most soils. Beautiful contrasts can be created using lighter sands and gravels in white, beige or yellow. Soils are mostly offered in the grain sizes standard, powder (extra fine) and multitype (mixed). Most sand substrates come with a grain size of 0,02 to 2 mm. Substrates with a grain size of up to 63 mm are classified as gravel, divided into fine, medium and coarse sizes. All soil types such as sand, soil and gravel are sent as parcels via DHL. Even with heavyweight products such as hardscape or substrates, we ensure that shipment runs smoothly and the goods come to you as quickly as possible.